Nehaa is a young and dynamic Vedic astrologer in our team, managing our Dubai office. 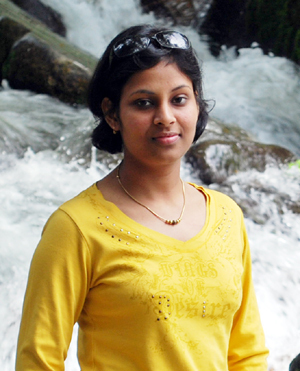 She is a product of prestigious Birla Balika Vidya Peeth, Pilani (Rajasthan) and Lady Irwin College, New Delhi, India. Being the eldest daughter of Shyam S. Kansal, a globally renowned Vedic Astrologer himself, Nehaa got a great advantage and privilege to learn and practice this divine science under his guidance. Her father took serious efforts to pass on this sacred knowledge to his two daughters, Nehaa and Himaani. She has never under-taken any formal education in astrology. However, the 24/7 backing and guidance by such an experienced astrologer, her father himself, was much more than she could have expected from the formal education of this subject in some astrology institute. Whatever her father learnt and gained in his pain-staking 25 years long astrological journey, he tried his best to pass-on all these experiences and knowledge of the subject to his two daughters, Nehaa and Himaani, in a very short span of time. She have full access to her father's vast library - containing best of Jyotish literature and some of the unique astrology softwares developed by himself for personal use only. What else she needed to hone her astrological skills? The primary and foremost benefit accrued to Nehaa was that she didn't need to start from scratch. The mysterious "Panch-pakshi Shastra" is a unique system of Vedic astrology, propounded by ancient Tamil Sidha Saints thousands of years ago, which has been considered a golden key in the hands of man which can be used with advantage in any endeavour and in any walk of life. Her father has written a software which can provide all vital information in a single table to the user on daily basis. She can provide this report in text format. She can create one of the most elaborate "Astral Gem Recommendation" report, providing complete logic with comparative astrological beneficence of various planets in a horoscope through scientific analysis for reaching a fine astrological conclusion. She is an accomplished Vedic Astro Numerologist also. She can help in knowing your Lucky numbers (and unlucky numbers as well) based upon intricate Jyotish principles considering overall planetary configurations present in a person's Birth-chart. Through this method, she can help you achieve phonetically correct name for yourself and your company. She can help in naming your new born baby by integrating the Alphabet suitability and his/her "Lucky number" in the name spelling. She can even suggest you a good Hindu name from her collection of over 15,000 names (for both genders, combined) . She has access to the special computer program, written by her father, to select appropriate Hindu names with utmost accuracy, which fulfills all desired astro-numerological parameters for naming a child. She can provide you many other useful and innovative astrology reports, details of which may be found on "Products and Services" page. She combines her knowledge of Vedic Astrology techniques to provide you better guidance and easy solutions to your problems. She can predict precisely to help you identify and achieve objectives; to recognize the unexpected opportunities and problems that one may encounter. If you are in UAE, you may take advantage of her astrological services through our DUBAI office. Most of the reports would be sent through email. However, she is also available for telephonic consultation, with prior appointment.